Stroke is the fifth leading cause of death and the number one cause of long-term disability. Seventy-five percent of annual stroke victims are older than 65. Post-stroke depression (PSD) is a common consequence of stroke, with the estimated prevalence ranging from 25% to 79%. Although several studies have investigated the impact of pharmacological interventions on PSD, there is a significant gap in knowledge regarding the efficacy of nonpharmacological measures for treatment of PSD. The purpose of the current integrative literature review was to synthesize the state of knowledge on selected nonpharmacological treatments for PSD and present findings regarding the efficacy of investigated treatments. Twenty-one studies published from 1992–2016 were identified and synthesized. Results indicated that studies demonstrating improvement in depressive symptoms included ecosystem-focused therapy, life review therapy, problem solving therapy, meridian acupressure, repetitive transcranial magnetic stimulation, music therapy, exercise, light therapy, motivational interviewing, and robotic-assisted neurorehabilitation. Stroke is the fifth leading cause of death and greatest cause of disability worldwide (Mozaffarian et al., 2016). With advancements in stroke treatments, coupled with the overall aging of the U.S. population, there are increasing numbers of stroke survivors living with the effects of stroke. These trends have led to more stroke survivors being discharged to home settings who are in need of rehabilitation and interventions to cope with the physical and emotional impact of stroke. Depression is a common consequence of stroke that causes increased morbidity and mortality (Williams, 2005). Although some patients may be diagnosed with depression, many more have depressive symptoms and often express feelings of sadness and lack of motivation to participate in rehabilitation (Hama, Yamashita, Yamawaki, & Kurisu, 2011). Post-stroke depression (PSD) is one of the more common consequences of the psychological impact of stroke. Prevalence of PSD has been estimated to be 31% in all stroke survivors, depending on setting, assessment instruments, time after stroke, and lesion location (Hackett & Pickles, 2014). PSD diagnosis is often missed despite the multitude of tools that have been developed for assessment (Fedoroff, Starkstein, Parikh, Price, & Robinson, 1991). This oversight is serious in that PSD—especially unrecognized and untreated PSD—is associated with less functional recovery, more cognitive deficit, and an increased risk of death (Lenzi, Altieri, & Maestrini, 2008). Studies demonstrate a strong relationship between depression and poorer health, especially as it relates to older adults (Rahimi, Wrights, Akhondi, & Richard, 2004). Depression reduces energy levels, concentration, self-efficacy, and motivation (Rahimi et al., 2004). Seventy-five percent of stroke victims are older than 65 (Rahimi et al., 2004). Older stroke survivors who are depressed see their primary health care provider more frequently and have higher rates of emergency department visits and longer hospital stays (Carota et al., 2005). Depression further impacts these individuals' ability to fully participate in rehabilitation (Cassidy, O'Connor, & O'Keane, 2004; Feinstein, 1999; Lenze et al., 2004). Studies suggest that PSD is correlated with a decline in function and less engagement in rehabilitation and recovery of function (Cassidy et al., 2004). PSD also negatively impacts quality of life (Cassidy et al. 2004); thus, reduced quality of life after stroke appears to be related to physical disability and depressive symptoms. Treating PSD is important to reduce excess morbidity and mortality in patients, and potentially alleviate caregivers' emotional distress (i.e., burden). Depressed stroke survivors who refuse to participate in rehabilitation become isolated and dependent on caregivers for accomplishing activities of daily living, which places additional burden on caregivers (McCullagh, Brigstocke, Donaldson, & Kalra, 2005). Treatment of PSD has been targeted primarily with pharmacological interventions (Paolucci, 2008). Antidepressant drugs, although commonly used and often effective for treatment of depression, are limited in their treatment effects and may not be appropriate for some older adults because of unwanted side effects, poor tolerance (El Husseini et al., 2012), or poor adherence (Moussavi et al., 2007; U.S. Department of Health and Human Services, 1999). Nonpharmacological therapies are considered any non-drug therapy and include interventions such as music therapy, exercise, psychotherapy, light therapy, yoga, herbal therapy, and cognitive therapy. The efficacy of such non-pharmacological interventions for the treatment of depression and depressive symptoms is not well known. The purpose of the current review was to present the state of knowledge on selected nonpharmacological treatments for PSD and synthesize the findings regarding their efficacy. MEDLINE, CINAHL, and PsycINFO databases were searched from 1992-May 2016. Keywords used were “stroke or cerebrovascular accident,” “depression or depressive disorder,” “integrative therapy,” and “complementary therapy.” Subcategories under depression were “treatment.” Exclusions included “anti-depressive agents.” All articles retrieved by these keywords via the electronic search engines were reviewed for inclusion. Additional articles from reference lists of studies reviewed were identified. Review articles and qualitative articles were excluded, as were studies with fewer than 10 participants, case studies, and unpublished data. Inclusion criteria for selection of the articles were original quantitative studies on complementary and alternative therapies and PSD that were published in English. Inclusion criteria were: randomized controlled trials and experimental, observational, and quantitative studies in peer-reviewed journals; participants had to be stroke survivors; nonpharmacological interventions had to be tested; and depressive symptoms had to be included as an outcome measure. Through use of the above search words and inclusion/exclusion criteria, 72 articles were identified. Titles were screened and duplicates removed. After reviewing based on inclusion/exclusion criteria, 21 quantitative research studies were selected for critical review and synthesis. The decision process of study identification and selection is included in the Figure. 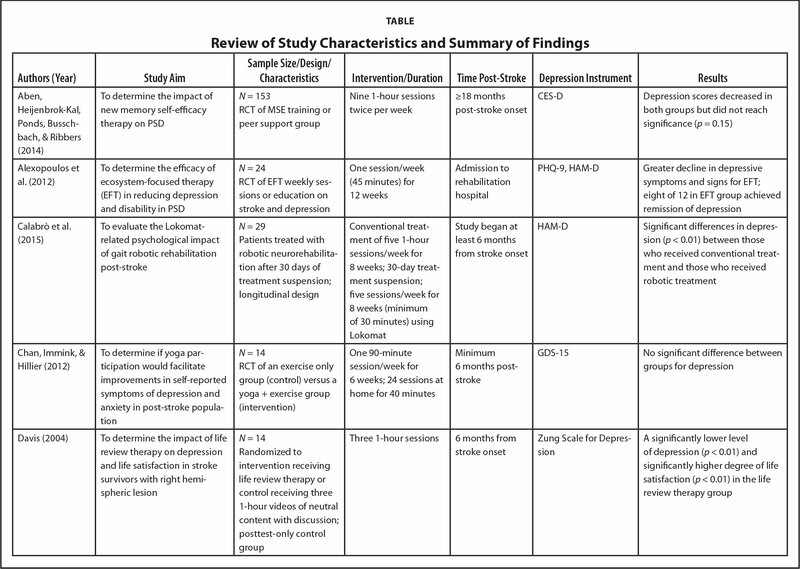 Study descriptions are presented in the Table, which summarizes relevant components of the included studies. Outcome measures other than depression were not the focus of the current review; thus, these measures were not included in the matrix. 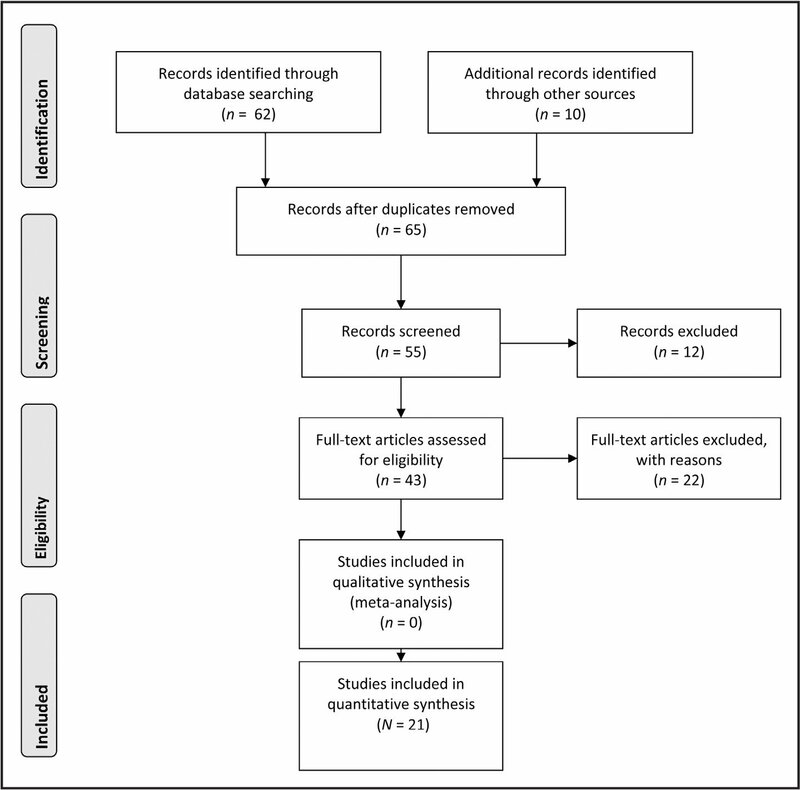 Preferred Reporting Items for Systematic Reviews and Meta-Analyses (PRISMA) literature search. Of 21 included studies, all except one had randomized experimental designs with a varying range of rigor. Sample sizes ranged from 14 to 411 individuals. Time post-stroke ranged from 48 hours (Hadidi, Lindquist, Buckwalter, & Savik, 2014) to 5 years (Lincoln & Flannaghan, 2003). Most depression instruments used were standardized, reliable, and valid; however, most were screening tools (e.g., Center for Epidemiologic Studies Depression Scale [CES-D]) rather than diagnostic instruments (e.g., Diagnostic and Statistical Manual of Mental Disorders [DSM; 5th ed.]). The following depression instruments were used: Beck Depression Inventory (BDI), CES-D, Geriatric Depression Scale, Hamilton Rating Scale for Depression (HAM-D), Hospital Anxiety Depression Scale, Wakefield Self-Assessment of Depression Inventory, 28-item General Health Questionnaire (GHQ-28), Yale Screening (yes or no), 4th edition of the DSM (DSM-IV), depression scale developed by Beyer (1984), Zung Scale for Depression, and the 9-item Patient Health Questionnaire (PHQ-9). The most frequently used instruments were the GDS, BDI, CES-D, and HAM-D. One study used the DSM-IV as a diagnostic tool to confirm depression. Finally, intervention frequency and duration varied widely among studies depending on the type of intervention. In reviewing the literature, evidence was grouped into six main categories: cognitive and behavioral interventions, exercise, music therapy, transcranial magnetic stimulation, and other nonpharmacological therapies including light therapy, meridian acupuncture, yoga, Reiki, and tai chi. Each of these therapies is defined and described. Etkin, Pittenger, Polan, and Kandel (2005) theorized that psychotherapy is a form of controlled learning that occurs in the context of a therapeutic relationship. Interventions designed to directly impact individuals' cognitive processes and behavioral outcomes were categorized as a cognitive and behavioral intervention, and included memory self-efficacy therapy (Aben, Heijenbrok-Kal, Ponds, Busschbach, & Ribbers, 2014), ecosystem-focused therapy (Alexopoulos et al., 2012), life review therapy (Davis, 2004), problem solving therapy (Hadidi et al., 2014), cognitive-behavioral therapy (CBT; Lincoln, & Flannaghan, 2003), and motivational interviewing (Watkins et al., 2007). Memory Self-Efficacy Therapy. The goal of memory self-efficacy therapy is to have clients develop a sense of mastery and self-efficacy and is based on Bandura's (1989) Self-Efficacy Theory. Aben et al. (2014) measured the subjective experience of memory capacity using objective memory tests. Training comprised general information on stroke and memory, training on memory strategies to improve abilities, and education on the psychological influence on memory. They added a component of cognitive training in their memory self-efficacy program through psycho-education with 153 stroke survivors. The rationale for their intervention was that symptoms of depression after stroke were thought to be directly related to cognitive impairment, meaning cognitive rehabilitation would impact PSD. The study was double-blinded. Memory deficit, but not depression, was part of the inclusion/exclusion criteria. Therapies were delivered across nine 1-hour sessions twice per week. Results indicated that although depression improved in both groups, it did not reach statistical significance (p = 0.148). Memory significantly improved in the treatment group, but not depression. It is noteworthy that although the two groups were not significantly different at baseline, there was heterogeneity within the groups that likely impacted the results. The study population was divided into groups of four to six patients based on age; 27% of participants were 65 and older and 73% were younger than 65. The older groups mostly comprised men and had lower depression and memory capacity scores than the younger groups at baseline. There was a large difference in depression scores at baseline between those older than 65 (mean CES-D score = 16.81) and the younger (mean CES-D score = 8.65) stroke survivors, explaining the inability of the intervention to demonstrate a significant reduction in depressive symptoms as a group (Aben et al., 2014). Ecosystem-Focused Therapy. Ecosystem-focused therapy in stroke comprises five integrative components that offer clients (a) a new perspective about recovery after stroke, (b) client assistance with a treatment adherence structure, (c) a problem-solving structure, (d) family assistance in reformulating goals and plans to accommodate their disability, and (e) care coordination with therapists to achieve more concerted and collaborative care (Alexopoulos et al., 2012). Alexopoulos et al. (2012) randomly assigned 24 stroke survivors with PSD to receive 12 weekly 45-minute sessions of ecosystem-focused therapy or systematic education on stroke, depression, and treatment. Use of the attention control group strengthened the study's design. Results indicated that eight of 12 participants achieved remission of depression, which mediated improvement in disability. Ecosystem-focused therapy primarily works by helping patients develop a more adaptive coping mechanism, increasing self-efficacy, and engaging patients directly in valuable and rewarding activities (Byerts, Lawton, & Windley, 1982). Because there is increasing use of resources, as well as engagement and collaboration of other disciplines in helping patients set and achieve new goals, ecosystem-focused therapy is effective in creating a sense of mastery and reducing depressive symptoms. Life Review Therapy. Life review therapy is a treatment strategy that facilitates the process of reviewing one's life experience, and during this process, addressing unsettled conflicts (Davis, 2004). In Davis' (2004) pilot study, 14 stroke patients were randomly assigned to either treatment of three 1-hour sessions of life review therapy or a control group. The control condition comprised each participant viewing three videos and responding to predetermined questions regarding what they saw. The videos had no therapeutic intent. The result showed a significantly lower depression score (p < 0.01) in the treatment group. The weakness of this study was that it was single-blinded; the researchers administered the treatment and control conditions to the experimental and control groups, and collected outcome data, which may have contributed to bias in the results. The sample was small and comprised primarily Caucasian individuals. Further, this was a post-test-only control group design. Problem Solving Therapy. Problem solving therapy (PST) is based on D'Zurilla's (1986) theory of social problem solving. The goal of PST is to teach clients to problem solve by breaking problems into simpler and more manageable tasks, and setting SMART (Specific, Measurable, Achievable, Realistic and based on a Time scale) goals and achieving them, thus reducing ineffective behaviors and emotional distress (Cuijpers, van Straten, & Warmerdam, 2007). Another goal of PST therapy is for clients to become more active participants in solving their problems through repeated sessions, which improves their confidence in self-mastery and self-efficacy. Although Robinson et al. (2008) and Hadidi et al. (2014) used PST as a preventive strategy for stroke survivors of whom not all were depressed, all of Mitchell et al. 's (2008) participants were depressed. Mitchell et al. (2008) used a randomized controlled trial (RCT) of 101 stroke survivors with depression and randomized them to intervention plus antidepressant drugs or usual care including antidepressant drugs. This study incorporated caregivers in the intervention, which could have significantly improved its effectiveness. Robinson et al. (2008) used a RCT as a preventive strategy for 176 non-depressed stroke survivors in a three-group design: double-blind, placebo-controlled comparison of escitalopram (n = 59); with placebo (n = 58); and non-blinded PST (n = 59). Results indicated that compared to placebo, use of escitalopram or PST resulted in significantly lower depression over 12 months of treatment. However, in using intention-to-treat analysis, it was noted that PST was not superior to placebo. In Hadidi et al. 's (2014) pilot study, stroke survivors (N = 22) who had a varying degree of depressive symptoms were recruited into a RCT and randomized with equal numbers in the treatment group (receiving 1.5 hours of therapy over 10 weeks) and control group (receiving usual care). Results indicated that although the mean baseline CES-D score was similar between groups (8.7 for treatment versus 7.8 for control), after 10 weeks of therapy, the treatment group's mean CES-D score decreased to 3.1, whereas the control group's mean CES-D remained unchanged. Although the difference between groups did not achieve statistical significance, the clinical significance is noteworthy. Further, participants were asked about the level of helpfulness of PST and 83% reported it was extremely helpful or very helpful, and identified the helpfulness of learning as the ability to analyze problems and break complex tasks into more manageable ones, provide motivation by setting SMART goals, and identify pros/cons of each solution. Cognitive-Behavioral Therapy. CBT is a form of psychotherapy based on the cognitive model of emotional response and emphasizes the important role of thinking on feelings and behaviors (National Association of Cognitive-Behavioral Therapists, 2016). The interventions, tailored to meet individual needs, include education, activity scheduling, graded task assignment, and identification and modification of unhelpful thoughts and beliefs. Similar to PST, CBT is problem oriented. In addition, it teaches patients skills that enable them to identify distorted thinking, modify beliefs, relate to others in different ways, and change behaviors. Lincoln and Flannaghan (2003) studied 123 depressed stroke patients and randomized them to three groups: CBT (10 1-hour sessions), attention-placebo, and standard care. CBT was found to be ineffective. The authors suggest that this lack of difference between groups may have been due to short duration of therapy, or therapists' inexperience. CBT is a cognitively challenging process and stroke survivors often are faced with some cognitive impairment, even if mild. Motivational Interviewing. Motivational interviewing is defined as a form of counseling by which therapists use empathetic listening to understand clients' perspectives and reduce resistance to effective problem solving or actions. Through respectful collaboration, therapists explore patients' values and goals as they relate to the problem at hand. Therapists coach and guide patients in exploring contradictions and ambivalence with behavior change of patient readiness for change (Rollnick & Miller, 1995). In Rollnick and Miller's (1995) RCT (N = 411), participants were randomized to either an intervention or usual care group. The treatment group received four weekly interventions each lasting 30 to 60 minutes. Motivational interviewing had significant impact on mood at 3 and 12 months post-stroke. It is important to note that most patients at baseline had high depression scores as measured by the GHQ-28. Exercise Therapy and Neurorehabilitation. One study investigated the impact of exercise on PSD (Lai et al., 2006). This study recruited 100 stroke survivors and randomized them to either three sessions of exercise to improve strength, balance, and endurance per week for 12 weeks, or usual care. Lai et al. (2006) found that there was a significant and almost significant difference between the two groups at 3 (p = 0.03) and 9 (p = 0.07) months, respectively. Because the study was single-blinded, participants were aware of which groups they were assigned. Use of an attention control group rather than usual care may have strengthened the design of the study and controlled for the attention the treatment group received. Adding a component of lifestyle changes to physical activity resulted in no significant difference between two groups in a RCT of 99 older adult stroke survivors in Norway (Lund, Michelet, Sandvik, Wyller, & Sveen, 2011). In this study, physical activity was offered weekly over a 9-month period to both groups. The lifestyle group, based on Lifestyle Redesign, which is a lifestyle-oriented occupation developed in 1997 in the United States, received additional group sessions focusing on physical activity, fall prevention, nutrition, outdoor mobility, stroke prevention, and engagement in pleasant activities, as well as peer exchange and socialization. Although there was improvement in depression in both groups, the differences were not statistically significant. Two studies focused on neurorehabilitation (Calabrò et al., 2015; Linder at al., 2015). In Linder et al. 's (2015) study, 99 stroke survivors were randomized to two groups: (a) home exercise alone and (b) home exercise plus robotic-assisted therapy (for 8 weeks). Robotic-assisted therapy is a technology in which a robot-assisted device provides repetitive task-specific activities with the goal of challenging patients to improve motor learning without having the direct supervision of a therapist (Kwakkel et al., 2007). Although there were no statistically significant differences in depression scores between groups (p = 0.48), both demonstrated improvement in depression from baseline (Linder et al., 2015). In Calabrò et al. 's (2015) longitudinal study, 30 stroke patients were enrolled and underwent conventional treatment followed by 30 days suspension of treatment and then treatment with robotic neurorehabilitation. There was a significant difference in depression scores at the end of conventional treatment compared to before robotic neurorehabilitation (p < 0.01). Studies on music therapy are inconclusive. In a study of music-movement therapy in a RCT of 40 stroke survivors receiving three hourly sessions per week for 8 weeks, Jun, Roh, and Kim (2013) did not find any significant difference in depression scores between the group receiving music therapy and the control group. This study recruited survivors only 2 weeks post-stroke, which may have influenced results. However, Kim, Park, et al. 's (2011) study on 18 stroke survivors receiving two 40-minute sessions of music therapy per week for 4 weeks found that participants in the treatment group had significantly lower BDI scores (p = 0.048) than the control group. This study was not blinded and no follow up was conducted to determine if the treatment effect persisted after music therapy stopped. In addition, the effects of antidepressant drugs were not considered in this study and could have been a strong confounding factor. Repetitive transcranial magnetic stimulation (rTMS) is a therapeutic noninvasive tool using electromagnet energy that generates a magnetic pulse. It is similar to magnetic resonance imaging in strength but is placed on the scalp. This low frequency magnetic field has been shown to cause cortical excitability and inhibition. Chen and Seitz (2001) conducted a double-blinded sham controlled study that enrolled 22 patients and assigned them to one of three treatment groups: low frequency stimulation (1 Hz), high frequency stimulation (10 Hz), or sham stimulation with 10 consecutive sessions over a 2-week period. The target was the right first dorsal interossei muscle. The high frequency (10 Hz) group showed a significantly lower BDI score compared to the baseline score (p = 0.04). Further, the high frequency group had significantly lower depression scores posttreatment compared to the other groups. Chen and Seitz (2001) noted that the patient population did not have medication-resistant major depression or cognitive deficit; thus, this treatment may be used as an adjunct therapy with antidepressant agents in the PSD population. Yoga promotes the recognition and union of mind, body, and spirit through movements and postures combined with breathing techniques. 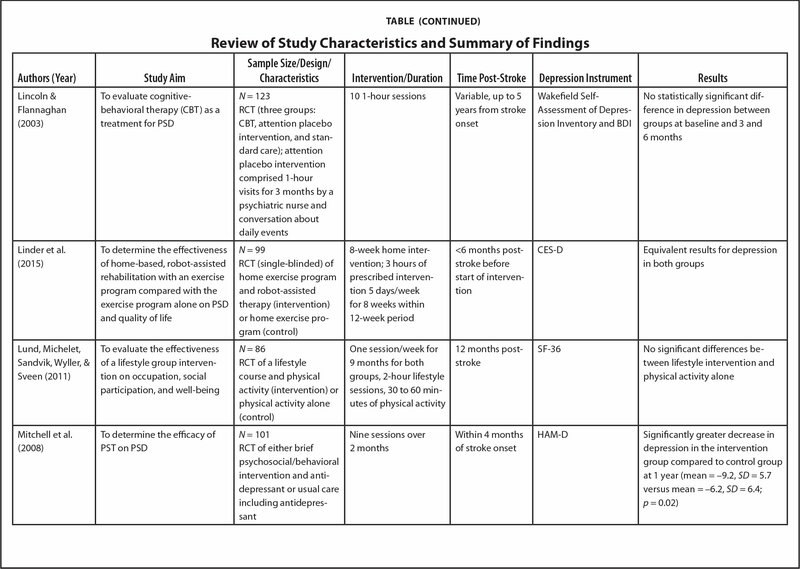 Chan, Immink, and Hillier (2012) conducted a study with 14 patients with PSD to determine the impact of the hatha style of yoga and exercise in self-reported symptoms of depression and anxiety. This single-blinded RCT randomized participants to a yoga and exercise or exercise only group. No significant differences in depression and anxiety were found between groups. Similarly, Reiki and tai chi had no significant impact on PSD. Reiki is the practice of manipulating nonphysical energy, which permeates the physical body, through the laying of hands on specific locations of an individual (Shiflett, Nayak, Bid, Miles, & Angostinelli, 2002). Tai chi has been regarded as a way of life and the highest form of martial arts, in which practitioners learn control of some body functions (Wang et al., 2010). In a double-blinded RCT with 50 stroke survivors assigned randomly to four groups using either a Reiki master, Reiki practitioner, Reiki sham, or no treatments, researchers found that Reiki had no clinical impact on stroke recovery, which included depressive symptoms and functional independence measures (Shiflett et al., 2002). In another single-blinded RCT with 34 stroke survivors, participants practiced tai chi for 50 minutes once per week for 12 weeks; the control group received rehabilitation of non-resistance and resistance training for 20 and 60 minutes, respectively (Wang et al., 2010). Researchers found no difference between the two groups at start and end points. Meridian acupressure, a component of traditional Chinese medicine, is a finger acupressure technique in which pressing on the meridian points guides the flow of “qi” (or life force energy) circulating through the body (Kang, Sok, & Kang, 2009). It was used in a RCT with 56 stroke survivors (Kang et al., 2009). Acupressure on 14 meridian points was administered to participants in the treatment group (n = 28) for 10 minutes every day for 2 weeks (Kang et al., 2009). Routine care was provided to the control group (n = 28). Results indicated that there was a significant difference in depression scores (p = 0.001) between groups. Kang et al. (2009) attributed this finding to improved circulation and stimulated endorphins, which decrease pain. Light therapy of 4,000 to 10,000 Lux was used in a double-blind RCT with 63 stroke survivors (Søndergaard, Jarden, Martiny, Andersen, & Bech, 2006). The sessions lasted 50 minutes once per week for 12 weeks at high and medium intensity. Findings showed a statistically significant improvement in depression intensity scores with high intensity light treatment compared to medium intensity light treatment (p < 0.05). Peng et al. (2015) conducted a RCT of neurolinguistic programming (NLP) therapy plus health education on stroke care. NLP was developed as an analysis of thinking and communicating, and as a method of achieving personal excellence (Peng et al., 2015). In the study, NLP comprised teaching breathing techniques to relax and increase strength, negative thought conversion, pressure-reducing methods, coordination training methods to control heart rate, and meditation to increase mental energy. The experimental group was compared to the usual care control group. Results indicated that depression was reduced immediately after intervention but not at 6-month follow up. However, there were only four sessions and they were not delivered by professionals. Lack of measures for fidelity of interventions and inadequate number of sessions may have contributed to lack of impact at 6-month follow up. 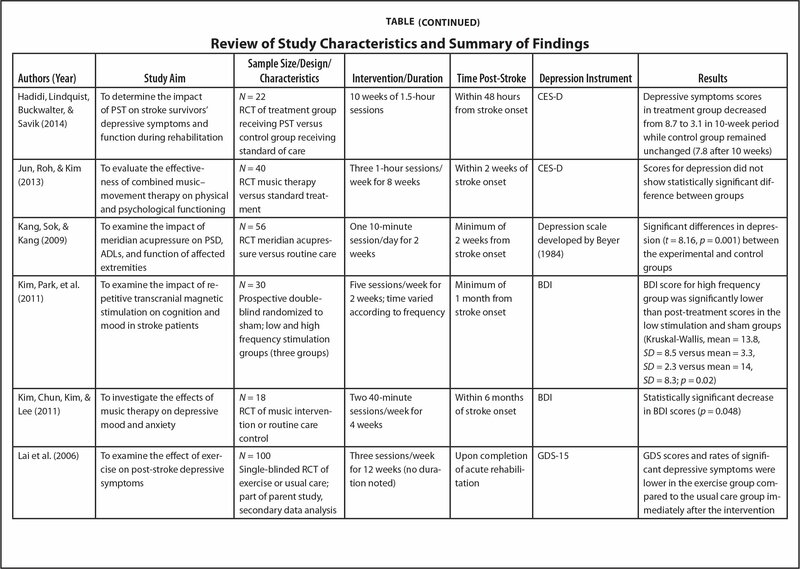 The current review included 21 studies and focused on presenting the state of knowledge on nonpharmacological treatments for PSD. Sample sizes ranged from 14 to 411 individuals. Time of implementation of post-stroke interventions varied from 48 hours to 5 years. Instruments used to assess depression were primary, valid, and reliable screening instruments, with the exception of one study using a diagnostic instrument (DSM-IV) (Robinson et al., 2008). Ten depression instruments were used among the reviewed studies. Although all had established psychometric properties, their validity in stroke patients was not determined. No studies differentiated their participants based on lesion location. Research has demonstrated that lesion location impacts PSD and could have an impact on individuals' ability to learn and retain new information (Boyd & Winstein, 2001). Regarding the effectiveness of interventions, studies that showed improvement in depression scores included ecosystem-focused therapy, life review therapy, PST, meridian acupressure, rTMS, music therapy, exercise, light therapy, motivational interviewing, and robotic-assisted neurorehabilitation. PST attained clinically significant results (Hadidi et al., 2014). However, due to the small sample (N = 22), no statistical significance was attained. Only short-term improvements were obtained with NLP. Studies that did not find statistically significant differences in depressive symptoms between treatment and control groups used memory self-efficacy, yoga, music therapy, CBT, Reiki, and tai chi. Several important considerations must be discussed. The settings in which patients were recruited varied among studies, which may be an indication of the severity of stroke and disability. For example, stroke patients recruited from acute care settings may have greater disability than those recruited from rehabilitation or community settings. Studies reviewed were not consistent in reporting the severity of stroke in their reports. Time post-stroke also impacts PSD (Burvill, Johnson, Jamrozik, Anderson, & Stewart-Wynne, 1997). The literature indicates some spontaneous recovery post-stroke up to 2 years (Andrews, Brocklehurst, Richards, & Laycock, 1981; Jongbloed, 1986; Katz, Ford, Chinn, & Newill, 1966; Skilbeck, Wade, Hewer, & Wood, 1983; Tilling et al., 2001), although most of the recovery attained is within 3 months post-stroke (Bard & Hirschberg, 1965; Carroll, 1962; Skilbeck et al., 1983). Studies reviewed had a wide range of time post-stroke, which may have impacted mood and recovery from PSD. The current review has several strengths and limitations. Several factors contributing to PSD were examined within the context of the various studies. 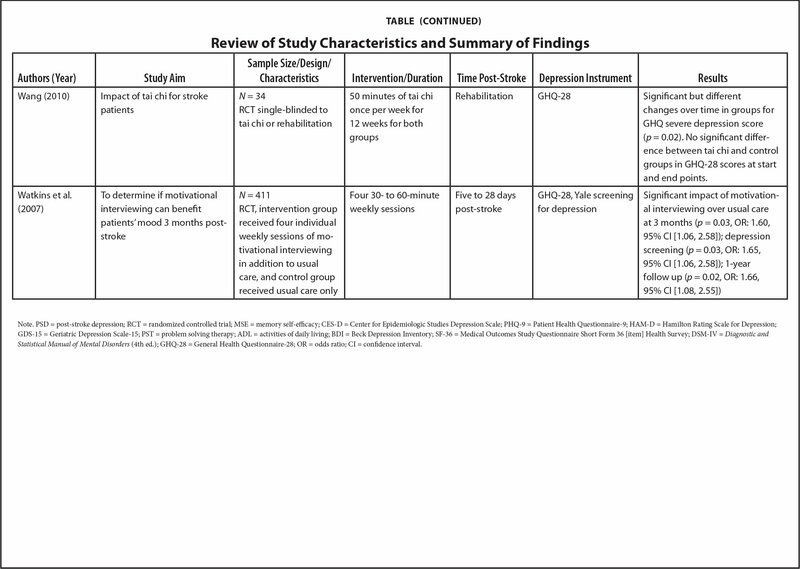 Because the purpose of the current review was to provide information on all nonpharmacological interventions that have been used across studies on stroke survivors with intention to reduce depression, evidence from each study was not graded, but findings were presented related to depression, as well as the studies' general strengths and limitations. The current findings have implications for practice and research. Nurses working with stroke populations must be aware of the significance and prevalence of depression post-stroke and should be able to guide patients and their caregivers to information on nonpharmacological therapies for PSD. They can also reassure patients and their families that PSD, while normal, is not always permanent. Nurses in home care and rehabilitation who are trained in specific areas of therapy can potentially administer therapies in the home and other care facilities. Considering that many stroke survivors do not comply with taking antidepressant agents for PSD treatment, nonpharmacological therapies must be explored. Family caregivers must also be informed of potential nonpharmacological therapies and resources in the community. Researchers should be aware of nonpharmacological therapies, their indications, and outcomes in stroke survivors. Future research should focus on therapies that have shown promise for depression treatment in stroke survivors. Treatment periods should be standardized, and the interventions assessed using the same measurement tool. Further, the mechanisms of action of each of these therapies should be explored and replicated in larger RCTs to determine if findings are robust. Understanding the mechanism of action of therapies will further enhance which should be individualized to better target and treat PSD. Ecosystem-focused therapy, life review therapy, PST, meridian acupressure, rTMS, music therapy, exercise, light therapy, motivational interviewing, and robotic-assisted neurorehabilitation are nonpharmacological interventions supported by research to treat post-stroke depression. However, research is limited and study samples are small; therefore, further research and careful implementation in practice are recommended. Bard, G. & Hirschberg, G.G. (1965). Recovery of voluntary motion in the upper extremity following hemiplegia. Archives of Physical Medicine & Rehabilitation, 46, 567–572. Beyer, J. (1984). The oucher: A user's manual and technical report. Evanston, IL: Pain Associates in Nursing. Byerts, T.O., Lawton, M.P. & Windley, P.G. (Eds.) (1982). Aging and the environment: Theoretical approaches (gerontological monograph...of the Gerontological Society, No. 7). New York, NY: Springer. Chan, W., Immink, M. & Hillier, S. (2012). Yoga and exercise for symptoms of depression and anxiety in people with poststroke disability: A randomized, controlled pilot trial. Alternative Therapies in Health and Medicine, 18, 34–43. D'Zurilla, T. (1986). Problem-solving therapy: A social competence approach to clinical intervention. New York, NY: Springer. Feinstein, A. (1999). Mood and motivation in rehabilitation. In Stuss, D.T., Wincour, G. & Robertson, I.H. (Eds. ), Cognitive neurorehabilitation (pp. 230–239). Cambridge, UK: Cambridge University Press. 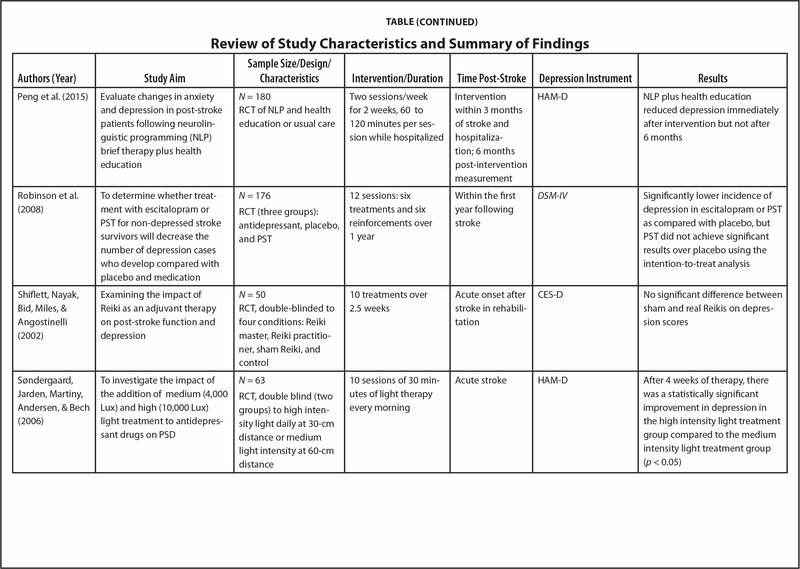 Wang (2010) Impact of tai chi for stroke patients N = 34 RCT single-blinded to tai chi or rehabilitation 50 minutes of tai chi once per week for 12 weeks for both groups Rehabilitation GHQ-28 Significant but different changes over time in groups for GHQ severe depression score (p = 0.02). No significant difference between tai chi and control groups in GHQ-28 scores at start and end points. Dr. Hadidi is Associate Professor and Coordinator, Adult/Gerontological Clinical Nurse Specialist, Ms. Wagner is DNP Student, and Dr. Lindquist is Professor, School of Nursing, University of Minnesota, Minneapolis, Minnesota. Address correspondence to Niloufar Niakosari Hadidi, PhD, APRN, CNS-BC, FAHA, Associate Professor and Coordinator, Adult/Gerontological Clinical Nurse Specialist, School of Nursing, University of Minnesota, 6–159 Weaver-Densford Hall, 308 Harvard Street Southeast, Minneapolis, MN 55455; e-mail: hadi0001@umn.edu.